Eleven-year-old Princess Cecilia — Celie to her family and friends — loves living in Castle Glower. She’s made it her job to know all the nooks and crannies and shortcuts, from the long-established ones, to the ones that crop up periodically. See, Castle Glower is definitely magical, and may be alive: it has opinions about the residents there (the state of your rooms is a definite indicator of its opinion of you), and chooses the person who would be best to rule the castle. Everything is grand at Castle Glower. That is, until the King and Queen leave to pick up their oldest son from the Wizard College, leaving Celie and her two older siblings — heir apparent Rolf, and sister Leliah — in the care of the castle. Unfortunately, the royals were attacked, and presumed dead. Suddenly, the council and neighboring countries are all over the Castle, supposedly “helping” Rolf take the throne. But the castle hasn’t changed the rooms; perhaps their parents aren’t dead after all? It’s a lot to take in, and that’s not even mentioning the creepy Vhervhish prince that is overstepping his boundaries. 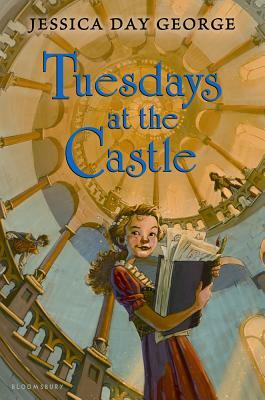 It’s up to Celie — and the castle — to stop what may have been a tragedy from becoming a calamity. I enjoyed this book. I agree with your assessment – the premise is the strongest aspect of the book, but having Celie as a strong character is a bonus. It's definitely one to recommend to middle grade fantasy fans.